I really like the new IF Redux. Clicks all of my modern and vintage buttons. My next new bike will be a similar but a single speed, of course. Real progress has been made on my IF, getting close and hope to have it rolling this weekend. Pics will be posted, comments welcome. Last edited by Zamfir; April 26th, 2013 at 10:41 AM. Hi spikes how are you doing ? Hows the ti fat going ? Im filling in the paperwork for a indy fab. And really want it to be painted in the old aquafade colour, that would just be bliss. Its ment to be my last mountainbike ( did i just say that) ti or steel, i have no idea ! Went on a fun and fast 25 mile shakedown on the IF yesterday. Bike performed amazing. Rides really nice and predicable, had a compliant feel. Compared to my normal ride (a Niner SIR9, steel 29er) it feels much quicker in the handling department but not twitchy in anyway. As for the looks i'm not super happy with the neon red stem and grey forks, but i'm considering having those repainted sometime in the future. Last edited by Zamfir; May 1st, 2013 at 11:56 AM. i like pragmatic bikes with this i don't give a f-word attitude more than a bling bling build which never gets ridden! 8 miles, 2400ft of smiles and pain. 18.5 lbs helped on the ups. I bought it from a guy in NYC who wasn't the original owner so the history is lost. I did confirm The # with IF though, I was surprised myself. I was the second owner, and I sold it to Atom, and he sold it to Matt. The frameset was bought from the original owner, who had the bike since 1996; lived in Chicago. This was a great riding frame, much like a Yo, but dare I say better, in that it was just as stable at speed, but not nearly as stiff when in the saddle over longer periods. It was kind of an emergency sale. It's cool. Did it stay local? New levers, Machine Tech Zero flex! One step closer to build nirvana. Still would like to find a Ti (wide) bar, a Paul's funky monkey cable hanger, and paint on the fork/stem. It did, but the guy turned out to be a real jerk. It'll sit in his attic as an "investment"
Thought i'd post a new side pic. I know, they are blindingly bright. As i've mentioned before this bike is a work in progress. Once I find a proper stem i'm going to have the fork and stem painted, all the other bits are staying. I've got a ss if with the track dropouts; one of my "go to" rides. Love it. 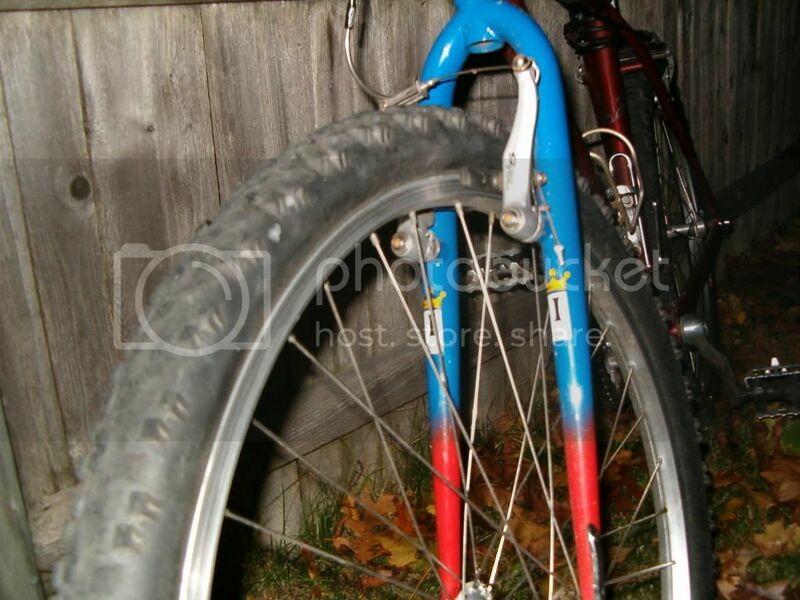 I really like the paint on your frame; should keep it; not something you see everyday. I need to post mine up...going to get some threads going, soon. I don't even think it will go on ebay. We'll see it in 20 years at this guy's estate sale maybe. It's one of those type situations. Made some minor changes to the IF, wide Taperlight bars, snow white Schwalbe's, and Campy front qr. I'm planning on swapping the crankset out for M900's and a Ti bottom bracket. Quick question for the more experienced minds. If I were to put in a rigid fork with about an inch less axle to crown distance than the P2 how much difference would it make in the handling department? Obviously it would steepen the ht angle, but would it quicken the handling so much it would ruin the ride? I ask because I recently picked a wonderful Gatorblade that I would love to put on the IF, but worry it would ruin the handling. In my experience the real issue becomes off-camber riding/cornering with normal cranks/pedals. Lowering the BB is harder to get over than the resulting slightly quicker steering. But you should buy the Gatorblade anyway if it's reasonable. That's one of the few investment-grade pieces of VRC IMO. Excellent point MF.....and one I didn't really think of. Ground clearance is a big deal in my area, lots of babyheads to navigate. Yeah I couldn't pass the fork up, it is just so damn cool and freshly painted by Toxic Harold. Nice! He painted my track bike. A Brodie OG. +1. I've had no problem going from 26 to 700c, so you'll be fine with Motolite BMX. I had an IF Unicrown fork as well and it was really nice. Lovely leg taper and a very, very nice ride. My t-butted Project 2 rides nice but I always have my eyes open for a IF fork as a replacement. All times are GMT -5. The time now is 9:34 AM.